Different types of headaches are described below. Premonition or prodromal phase. A change in mood or behavior may occur hours or days before the headache. Aura phase. A group of visual, sensory, or motor symptoms can precede the headache. Examples include vision changes, hallucinations, numbness, changes in speech, and muscle weakness. Headache phase. This is the period during the actual headache with throbbing pain on one or both sides of the head. Sensitivity to light and motion are common, as are depression, tiredness (fatigue), and anxiety. Resolution phase. Pain lessens during this phase, but may be replaced with tiredness, irritability, and trouble concentrating. Some people feel refreshed after an attack, others don't. Tension type headaches typically don't cause nausea, vomiting, or sensitivity to light. 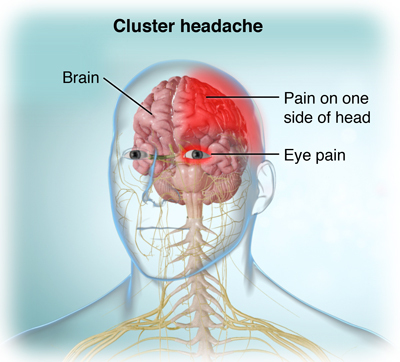 Cluster headaches usually occur in a series that may last weeks or months. Headaches are classified as primary or secondary. A primary headache means the headache itself is the main health problem. but other factors such as muscle tension or exposure to certain foods may be triggers. Other things that may help cause the headache include medicines, dehydration, or hormone changes. A secondary headache is related to an underlying health condition. An example of this would be a headache caused by a neck injury, eye problems, or an infection in the jaw, teeth or sinus . Tension type headaches typically don't cause nausea, vomiting, or sensitivity to light (photophobia). The symptoms of a headache may look like other health conditions. Always see your healthcare provider for a diagnosis. Your doctor will ask about your health history. He or she will also do a physical exam and certain tests. Do you have a history of head injury? Do you have other symptoms during a headache? If your doctor suspects migraine or tension-type headaches and the nervous system exam is normal, you may not need any further testing. But it is not a primary type headache, or if you have uncommon symptoms, other tests may be done to find the cause. Blood tests. Various blood and other tests may be done to check for underlying conditions. Sinus X-rays. An imaging procedure done to look for congestion or other problems that may be corrected. MRI. A test that uses a combination of large magnets, radio waves, and a computer to produce detailed images of organs and structures within the body. CT scan. An imaging test that uses X-rays and computer technology to make detailed images of the body. A CT scan shows detailed images of bones, muscles, fat, and organs. 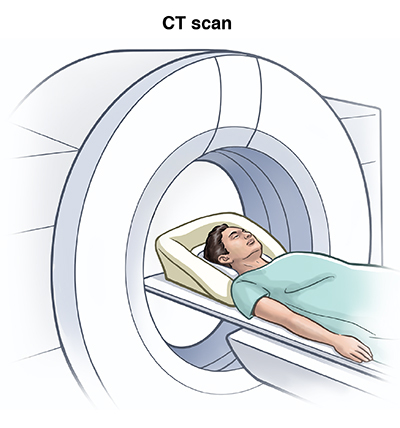 CT scans are more detailed than general X-rays. Abortive medicines. These are medicines prescribed by your healthcare provider. They act on certain receptors in nerves and blood vessels in the head to stop a headache in progress. Rescue medicines. These medicines include pain relievers bought over the counter, to stop the headache. Preventive medicines. These medicines are prescribed by your healthcare provider. They are taken daily to stop a headache from starting. Some headaches may need medical attention right away. This may include a hospital stay for observation, diagnostic testing, or even surgery. Treatment depends on the condition causing the headache. Full recovery depends on the type of headache and other health problems you may have. If you know what triggers your headache, staying away from the triggercan prevent a headache. Reducing stress can ease or prevent headaches caused by stress. Migraine and cluster headaches may be prevented by taking a daily preventive medicines. Change in level of consciousness. Types of headaches include migraine, tension, and cluster. Headaches can be primary or secondary. If it is secondary, it is caused by another condition. Staying away from your headache triggers is the best prevention. Mild to moderate headaches can be managed with over-the-counter medicines, but tell your healthcare provider if your headache is severe and you have other symptoms.